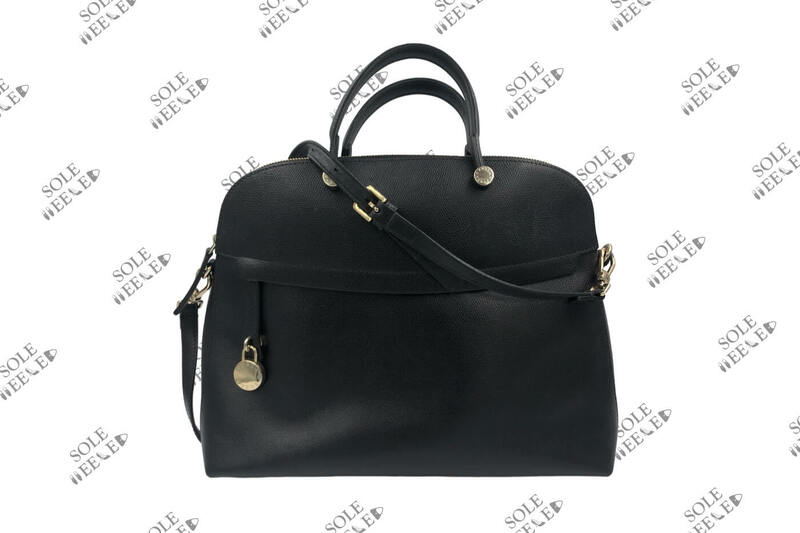 SoleHeeled offers convenient and affordable Furla handbag repairs by Australia’s best craftsmen, with free shipping to your door. This case study outlines how we recently repaired a customer’s Furla handbag. This Furla Piper Top Handle Tote bag is defined by a stylish silhouette and a convenient shoulder strap that makes it perfect as an everyday fashion accessory. However, the leather loop/tab and ring attaching the shoulder strap to the body of the bag had torn right off — clearly having borne too much of the weight while being carried. When this customer reached out to us for a free diagnosis / quote, we offered to repair the strap — re-creating a new leather loop and replacing the missing hardware that was once attached to it. We custom cut a piece of high-quality leather to reconstruct a leather loop matching the missing piece, along with the missing ring to which the shoulder strap was attached to the leather loop. To get everything looking right, we needed to first unstitch the leather panels around the old leather loop, removing the existing loop and replacing it with the newly constructed one before re-stitching the area. Have a Furla handbag needing repair or restoration? Our experienced craftsmen have been trusted by not only generations of Australians but also local and international brands (including Versace and Canali) with the repair and restoration of luxury designer handbags since 1955. If you have a beloved Furla handbag in need of repair or restoration, ask us for a free diagnosis/quote by completing our online order form — where you can upload photos of the bag and let us know exactly what you would like done to it, or let us advise you on what the bag needs based on the photos. Send your bag: Drop your handbag off at a local post office for free packaging and shipping to us.